Understanding Agile Marketing – What is a Content Item? In the series of articles I have created up to this point, we have talked a lot about understanding who our audience is; what goals they have and problems they face. We have addressed the need for a Content Mission Statement inside our Content Strategy to get the appropriate buy in from the business leaders in our organization. We are all excited to get started on our content initiatives and beginning delivering value to our target customers and influencers. Before we get started, let’s address a few key ingredients we need to make sure our sights are aimed correctly and we achieve the maximum impact. We could absolutely spray and pray at this point, but the agile process still has a few tricks up its sleeve that we can use. In this article, we will address the Content Items that make up a Content Backlog. For a refresher, the Content Backlog is simply the prioritized list of work. The Content Owner, decision maker on the team, grooms the backlog on a regular basis by reviewing the items and deciding what has the highest priority. Priority can be determined by many factors such as: timing of events, need for missing content, new audiences, change in organization direction, seasons, team dynamics and availability, and many more. We will address these concerns and more later, but it is good to have a brief understanding of them now before we talk through what makes up the Content Backlog. Ann Handley recently shared on Twitter a meme of Simba with his father sitting on the edge of a cliff and his father said, “All that the light touches is content.” I literally laughed out loud when I saw this scroll across my feed. It captures the dilemma of Content Marketing so well; what is the definition of content? If Content Marketing is producing valuable assets for a targeted audience on a consistent basis, then the assets we are producing are content. The beautiful and terrifying aspect of content is it is whatever we need it to be to provide regular value to our audience. Content has to deliver an experience that is greater than our competitors, which is also highly subjective, to the audience we are targeting. Content can also be delivered through different vehicles. We need it to reach the maximum audience we need for our niche and with the resources we have available. These vehicles can be digital, print, live events, graphical, or whatever else we can imagine. Can Content Spark an Emotional Response? Keeping a corporate blog with corporate speak about our industry might be exactly what you need to meet the criteria of most Content Marketing initiatives, but I believe we should attempt to go beyond this and reach our audience at an emotional level. Let’s deliver content that can bring a tear to their eye or goosebumps on the arms of our audience members because of the stories we tell. Let’s have them watch our videos or read our content and hear them say, “This article was written just for me.” Joe and Robert of the Content Marketing Institute do this to me every Tuesday morning through This Old Marketing. Let’s produce podcasts that make our listeners laugh out loud at the gym with tons of people looking back wondering what they are listening to. To deliver these types of experiences, do the due diligence of planning and understanding your audience. We also have to build trust and authority over time through consistent delivery to this audience. If this is what you want out of your content, let’s continue by defining what goes into a Content Item. What is a Content Item? The software developer in me wants to define a Content Item as the group of metadata we will use to ensure our content reaches the specific audience we want it to and contains the information we need to appropriately size and scope it for production. However another definition that is more palatable would be: a Content Item is the representation of a piece of content in the agile process. The first definition focuses on the flexibility of the Content Item while the second addresses the utility. Just as everything else in the agile process has been flexible, the template for a Content Item is as flexible as we need it to be. Content Items have many stages of life. They can represent ideas in very early phases; drafts that need more formal review; change requests or content in the hands of our audience. We keep content as part of the backlog during these phases because they are living assets that age quickly. Every month, quarter, year, and decade, information changes which causes our content to need a refresh. Title – The name of the item you use internally to refer to the content. This field does not have to be public facing and most Content Developers create a task for the headline, chapter title, or whatever else you will use to describe the content to the public. 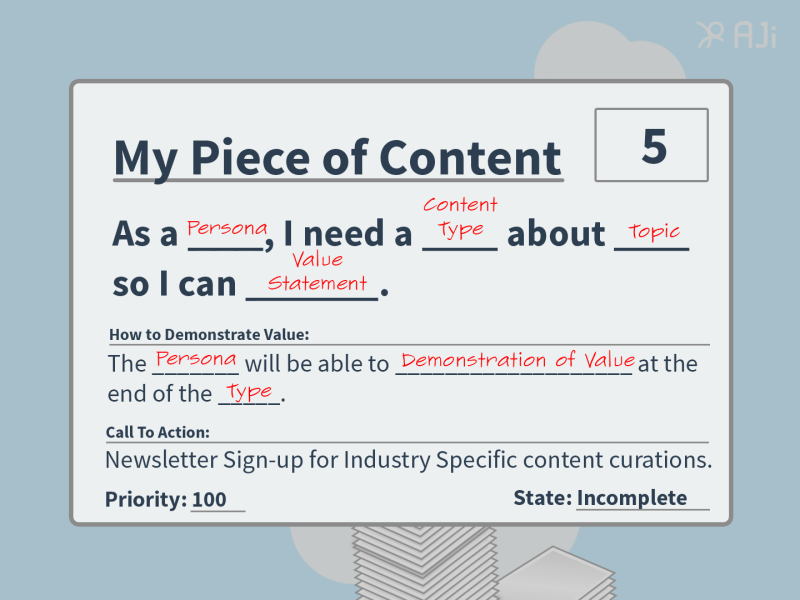 Content Story – A set of sentences that list the persona, content type, topic and the value you plan to offer with the content. This is the heart of the content item and should be created first. How to Demonstrate Value – A list of bullet points or statements that describe the way you plan to deliver the value you state in the Content Story. This will be used to determine if the content is complete and ready to be published. Priority – How important this piece of content is, in view of the current and future work of the Content Developers. This field is assigned by the Content Owner. Estimate – The level of effort determined by the Content Developers who will directly work on the content. Tools like Planning Poker® and story points can be used as the value of this field along with any other consistent measurement your team uses to describe the size of a Content Item. ID – Unique Identifier you use to refer to the item in the tasks created or when the Content Item depends on another item before work can begin. Call to Action – The way you plan to prompt the user to continue movement within your audience or to move along a customer journey. State – The status of the Content Item in your development process. The content typically can be in the following states: concept, draft, in review, active, or aged. We have three key roles in the Agile Marketing team: Content Developers, Content Owner, and the ScrumMaster. Each play a very important role in the process. Content Developers – Generate ideas, ask questions about the goals and ways we plan to provide value, and provide a level of effort to the creation of the Content Item. Content Owner – Provide insight to the audience we are reaching, determine the priority of the items we have in the Content Backlog, and answer any questions the team has about the Content Item. ScrumMaster – Facilitate the planning meetings, ensure each member of the team is performing the roles assigned, removing any roadblocks or issues that come up, and work with the Content Owner to ensure the Content Backlog is being groomed as new items are created or organizational shifts occur. When you start developing your Content Items, you will realize they have a life of their own just like the content you are creating. They can represent bigger items in the early stages of your content discovery process and later can be broken down into smaller components of work, the closer you get to the creation of your content. Items can also refer to other Content Items when development needs to be halted because of outside influences or contributors that are not currently part of your team. They can be part of your current workload, an item you created a few years ago, or an idea that lives at the bottom of your Content Backlog that you will likely not ever complete. Since the Content Items move throughout the process, you should make sure you put a high level of effort into defining the items. So many people just consider this a slip of paper with an idea on it and they flush it out during the creation of the content. Kind of like a placeholder to a future conversation they will have, but I believe they can be so much more. In my eyes they are more like promises of value you plan to deliver to your audience. By taking the time to really dig into the theme or concepts behind the content and define the story and the way you plan to execute on the delivery of the asset, you can really determine what should be created next and what will deliver the highest impact and quality. Content Items are more than the hours a team plans to contribute to the production. They are more than just words on a page, video clips put together, or a graphic describing the outcomes of a study. They have the ability to educate the audience, solve problems, and can be the missing piece to someone else’s work. Ideas will be formed, goosebumps will be had, and emotions will be stirred when you invest when you invest not only your time but your best efforts into your content. Content Items will be our compass to ensure we know what audiences and goals we are investing in. This article was syndicated from Business 2 Community: Understanding Agile Marketing – What is a Content Item?